The Interactive Health Kiosk is an invaluable tool to check the health of your workforce, community, organisation or individual. Portable, reliable and affordable, the Health Kiosk is quick, easy to use and delivers immediate confidential results. Taking a Health MOT can take from as little as 5 minutes enabling users to self-test key indicators of their general health and wellbeing and walk away with an anonymous printout of their results with a comparison to medical accepted standards. The Interactive Health Kiosk is effectual as an early warning system for potential health problems such as high blood pressure. The Interactive Health Kiosk checks your basic health before moving on to more specific features that have been pre-selected by you. Within a few minutes of stepping on to the Health Kiosk, the user will have a printed confidential report of their results showing a comparison to accepted medical standards. Individuals can register their details on the Health Kiosk, allowing them to track and view their history of results. By registering an account, which is confidential to each individual, their login details will allow access to view their history on the Health Kiosk so that they are able to track their own health metrics over time and print out additional history reports showing their progress. In addition to being able to view results on the Health Kiosk, Wellbeing Tracker our online portal, syncs with the Health Kiosk – each time a Health MOT is carried out, the results are automatically populated into the ‘My Wellbeing Graphs’ module on Wellbeing Tracker. This enables users to look to track and measure their results at any time, as well as being able to manually add other health readings, such as blood glucose and cholesterol test results. Results are collected automatically by the Health Kiosk for use in an aggregated report. This report will maintain the anonymity of each individual, whilst giving you unique and usable data on the current health of your workforce. 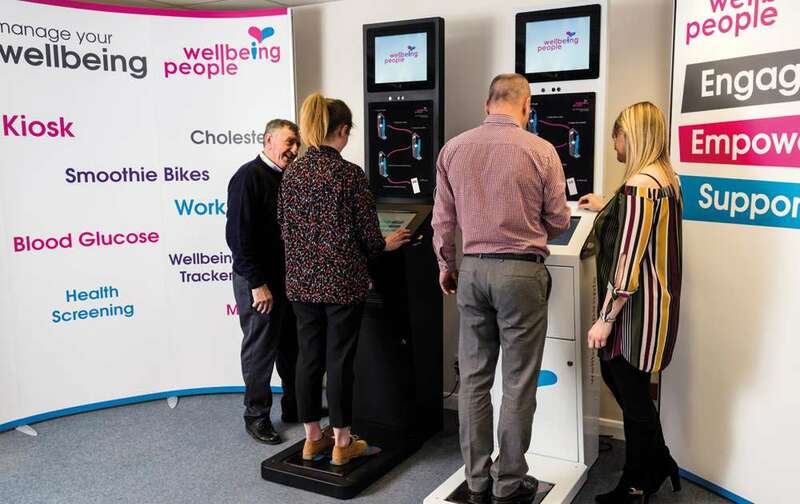 Each feature used on the Health Kiosk can give you diverse data and analysis allowing you to get incredible insight into the health and wellbeing of your staff which will enable you to build a wellbeing strategy. In addition to the core Health MOT, there are a selection of Health Kiosk Software Applications which maximise the health screening for both the individual and the business. We can tailor each programme/rental to your specific needs, manipulating and tweaking our features to get the data and outcomes you want. We will discuss your requirements with you and build a rental package to accommodate. 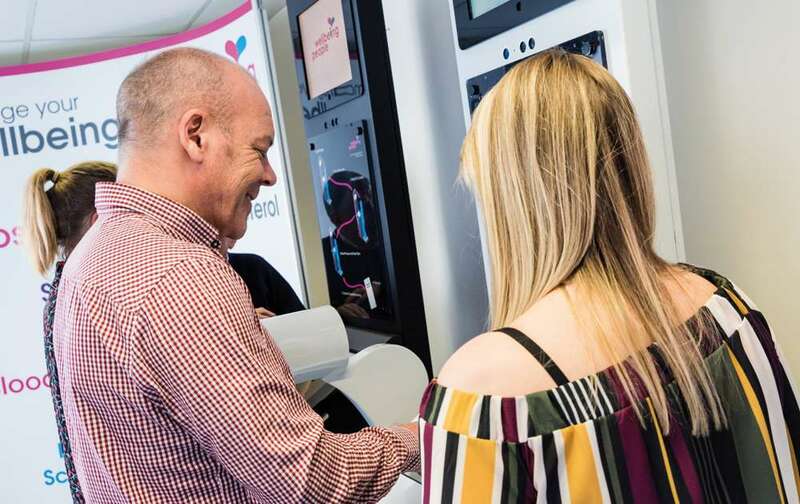 Rental of the Interactive Health Kiosk can be for just one day, a few months or longer – whatever fits in with your budget, timescales and location. We offer complete flexibility. Interactive Health Kiosk training, delivery and collection are included as part of all rental programmes. Users can create personal accounts to keep track of multiple tests, compare results over time and send results to their email address. These accounts will have no effect on the anonymity of the data stored and will be encrypted and password protected. The Health Kiosk links to our online portal, Wellbeing Tracker and provides access to support channels and tools. The Health Kiosk can also be used as a referral tool, giving the user the option of referring themselves to other services or resources, such as Employee Assistance Programmes, that your company may provide. If the rental period is such that the Health Kiosk is remaining onsite unsupported by our team, we would provide onsite training to the site contacts for the correct use of the Health Kiosk. Our Health Kiosks are 3G enabled; it allows us to remotely access the Kiosks should there be a requirement. Should a fault occur whilst the Health Kiosk is onsite, we aim to resolve the problem and would exchange a Kiosk if necessary within a time frame of around 24 to 48 hours. If there is no 3G connection in the location, we would look to connect to WiFi or hard wire the Health Kiosk to the internet if possible. In either instance, once 3G reconnects, any emails with results will be automatically sent. Our Admin and Marketing Teams are also on hand to help with the operational and promotional side of your Health Kiosk Programme. 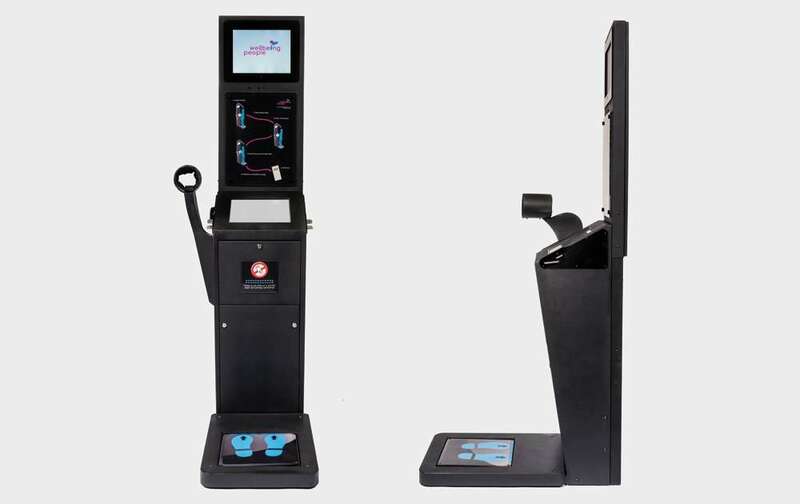 Our Interactive Health Kiosk can be located in most offices and buildings, it just needs to be near a power socket and room for the user to step on and off, of course! Popular areas such as canteens, reception halls, foyers and break-out or waiting room areas work best as they are highly populated and frequently visited enabling employees to self-monitor their health and wellbeing at a convenient time. The Health Kiosk can be positioned outside too, as long as there is access to a power point and a level hardstanding or surface. This is great for Health Fair Days or in conjunction with another product such as our Smoothie Bikes. We will erect a gazebo to protect equipment in the event of rain or adverse weather. 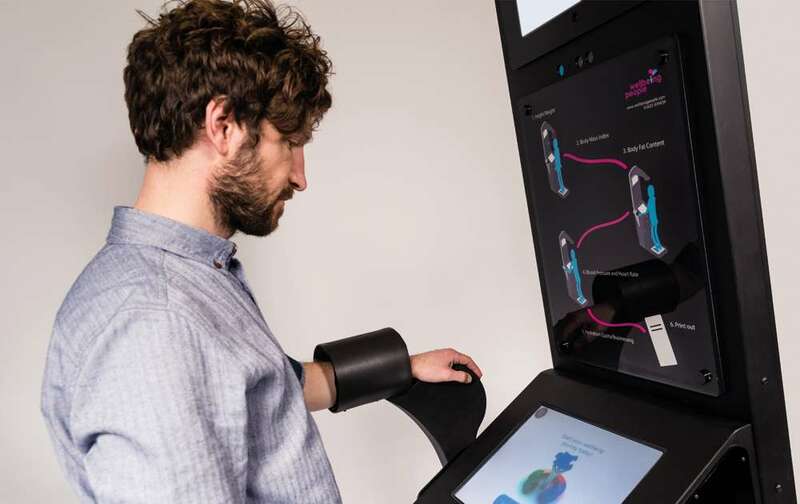 The Interactive Health Kiosk is an early warning system for potential health problems. Through engaging staff, positive lifestyle changes can be made which leads to a healthier and more productive workforce. Wellbeing People believe that it is imperative to work with our clients to maximise the results and engagement from our programmes; empowering employees to make positive choices around their health and wellbeing. Helps businesses to understand the health of their workforce and to build a wellbeing strategy from the results.